Nationwide, house prices grew at an annualized rate of 7.3% according to fourth quarter 2012 numbers, recently released by Case Shiller. Real estate prices are local, however, and nationwide trends are sometimes different than those in Oregon. 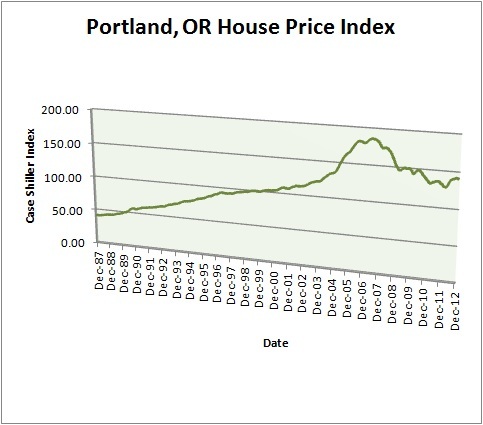 Portland is the closest city tracked by Case Shiller, and they’ve been trending up as shown below. Real Estate prices have been generally trending up in Eugene Springfield Oregon since last summer, 2012, which is a welcomed trend. This entry was posted in Real Estate and tagged eugene oregon real estate blog, Eugene Sprinfield Oregon real estate prices, lane county oregon real estate blog, springfield oregon real estate blog. Bookmark the permalink.